Yes. I am one of those people that lets my cats on the counters. Sue me! Saturday Snapshot is hosted by Alyce at At Home with Books. In which Fiona has to kiss her boyfriend goodbye. 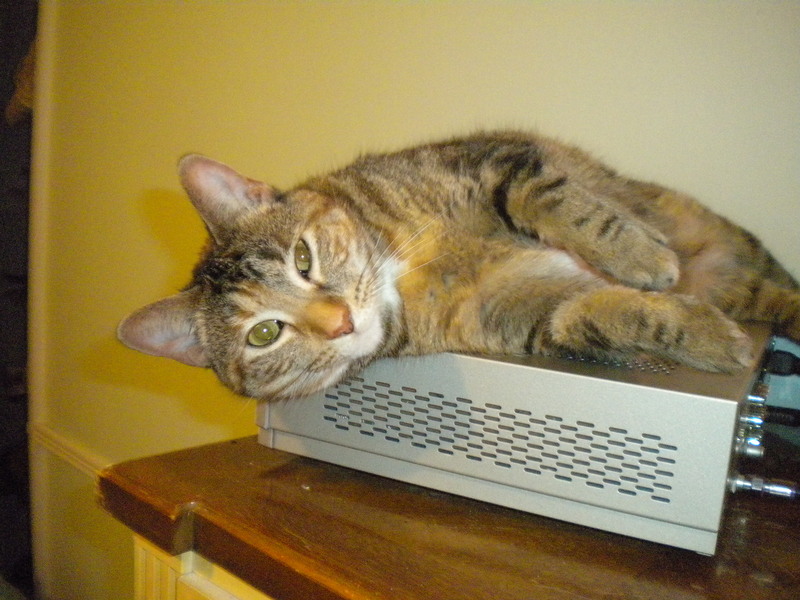 Fiona spends all day (and I mean ALL DAY) snuggling up with her boyfriend, the cable box. I guess it’s the warmth, but she spends hours daily lounging up there. Alas, the cable company my husband works for is launching a new cable box wherein there is one cable box for the entire house and each TV is somehow synced to it. I don’t know, I am dumb about technology, but anyway . . . as of this past Wednesday, there is no cable box upon my dresser for Fifi to lounge upon. Poor baby. She will probably have withdrawals. 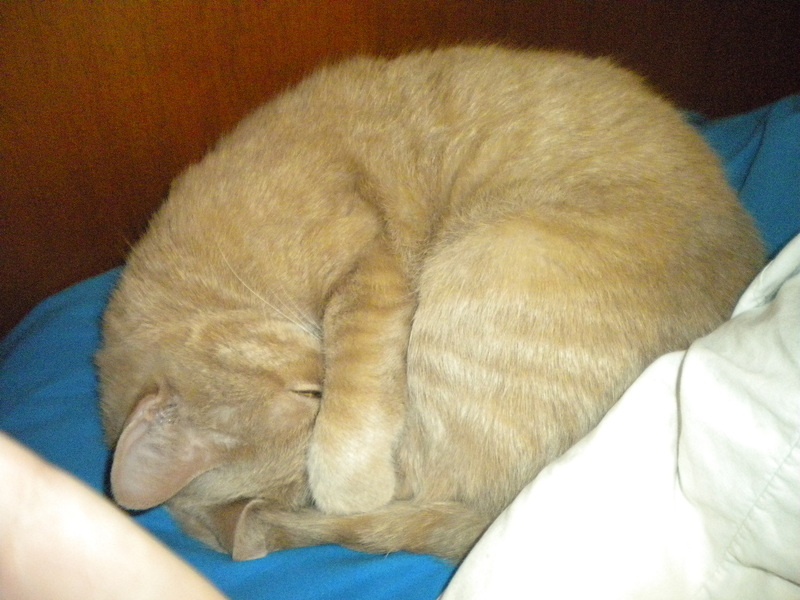 Milo decided to sleep next to me as I was blogging the other day. Notice the slit of his eye–he had realized that I was reaching for my camera and was sneaking a peek at what I was up to. Someday I will post a picture that doesn’t involve one of my cats. Maybe. This is Milo and my husband sound asleep. 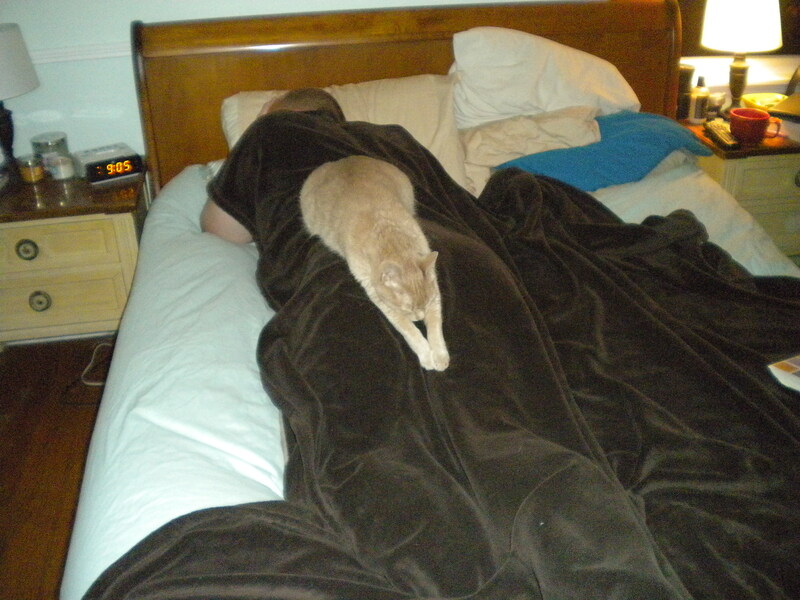 That is how Milo sleeps evey night, although he usually switches off between the two of us. Last week, I shared a photo of my two boys Milo and Chumlee, so this week I wanted to introduce you all to their sister, Fiona (also known as Fifi). 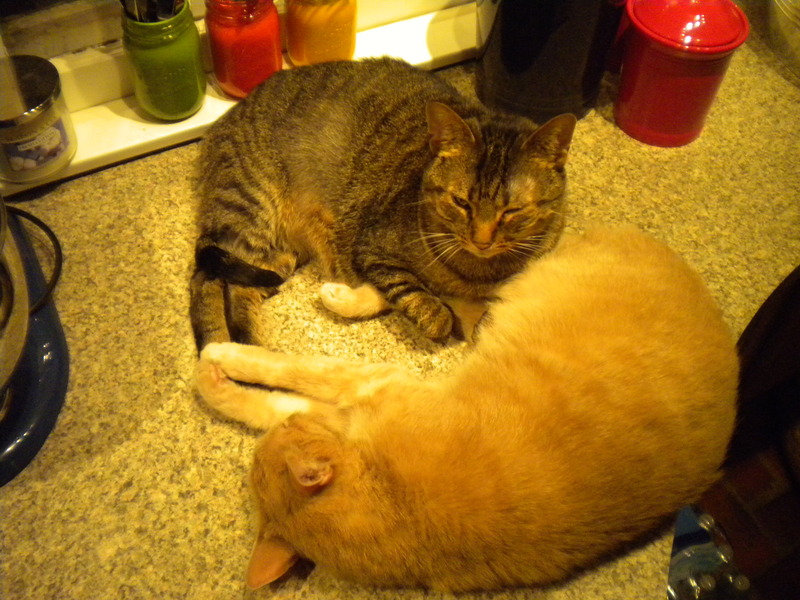 Fifi is very rarely caught dead with her brothers. She would prefer to be an only child. As fickle as she is, you could not find a more loyal cat. Every night she sleeps with me, either on the pillow right next to my head or, if it’s colder, under the blanket curled up next to me. I found her at two weeks old and raised her from that point, so she is very special to me. 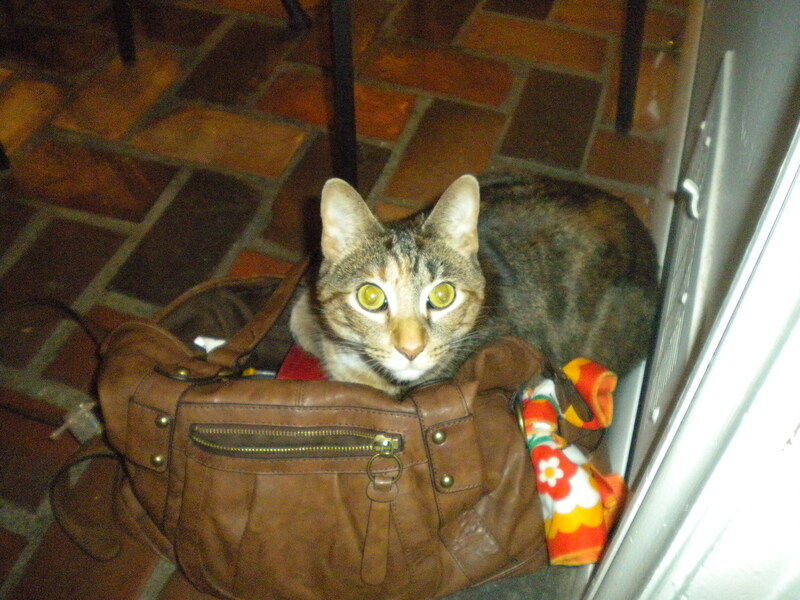 And here she is sleeping on my purse! She is notorious for choosing the most uncomfortable sleeping spot imaginable. I caught my two boys sleeping with their arms around one another the other night. 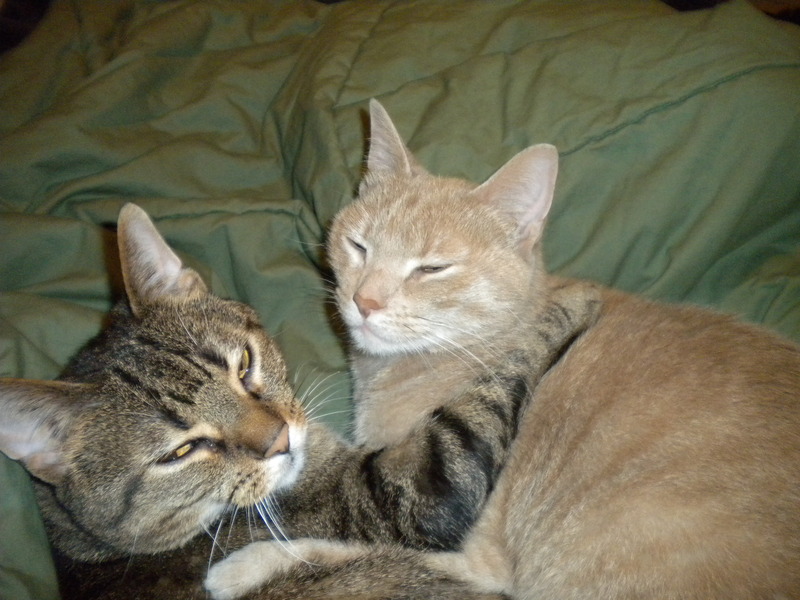 Charlie is the darker one on the left, although we have renamed his Chumlee after the guy on Pawn Stars, and Milo is the sandy colored guy on the right. Now that I have a camera, it is a lot easier for me to catch moments like this!